Simon G. Griffin (1824-1902), Brigadier General, USA (NH). 1st Manassas, Burnside NC expedition, 2nd Manassas, Antietam, Fredericksburg, Vicksburg campaign, Petersburg, Richmond. Document Signed (DS), 1 page, 4to., GAR Post 4, Keene (NH) 9/28/99 pertaining to certificate of transfer for a 16th OH Inf. GAR member (Pike). 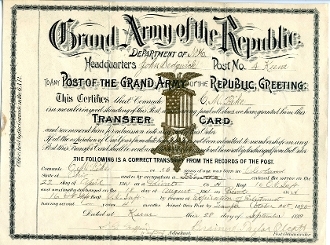 VF and attractive certificate with GAR medal depicted.